Located downtown on Saint-Alexandre Street, this 757 sq.ft. 2-bed, 1-bath loft-style condo is the quintessential urban setting. Eleven-foot, sand-blasted, concrete ceilings, large fenestration and contemporary décor make this a very inviting unit for your stay in Montreal. 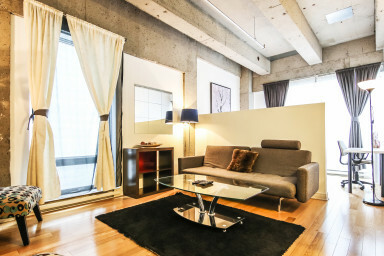 This fully-furnished executive loft perfectly embodies modern open concept design, yet benefits from a closed bedroom. The bright, stylish den holds a large flat screen television and sofa-bed while a partition creates a hidden guest room that doubles as a quiet study. Hardwood floors throughout, this two bedroom, one-bathroom condo is comprised of a linear kitchenette with granite countertops and breakfast bar and is fully-equipped with high-end appliances, while the bathroom offers equally designer finishes. The closed queen-sized bedroom features deluxe memory foam mattress and includes generous closet space. Urban living made easy. Be tempted by a 2 bedroom executive suite for rent ! Newly renovated, the Quartier des Spectacles has become one of the liveliest areas of Montreal. Headquarters to Montreal’s International Jazz Festival, Just for Laughs festival, Francofolies and other major cultural events, the Place des Festivals annually attracts hundreds of thousands of Montrealers and tourists from around the world. Here you will also find easy access to the Underground City. Due to Montreal’s harsh winter climate, the city developed a vast underground network linking together over 30 km of tunnels and over 120 access points. 500,000 people use it every day as it provides access to numerous stores, malls, restaurants, banks, hotels, office buildings, residential towers and the metro system. Be sure to check out the grand Place des Arts Theater just up the street, the Museum of Contemporary Art and the Complexe Desjardins also nearby. With a vast variety of activities, shopping and entertainment at hand, the Quartier des Spectacles has it all!